In Chinese culture, people who are outstanding or brave are often compared to the dragon. It is said a dragon overcomes obstacles until success is his/hers. A dragon is energetic, decisive, optimistic, intelligent and ambitious. 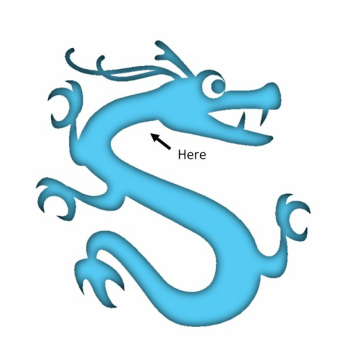 Dragons have one scale growing in the opposite direction to all the others at their﻿﻿ throat. They dislike anyone touching this reverse scale. Although the dragons are normally do not harm humans, if anyone would touch the reverse scale, the dragon is said to become very angry and kill the person immediately. The dragon's reverse scale had become a figurative expression of something you should not touch, and “touching the reverse scale” had come to mean “offending the emperor or a man in power”.